Standing under a Majestic Oak – the most common reaction is to look up and admire the weaved branches and leaves as nature’s work of art. However, another work of art exists within trees – healthy tree roots. 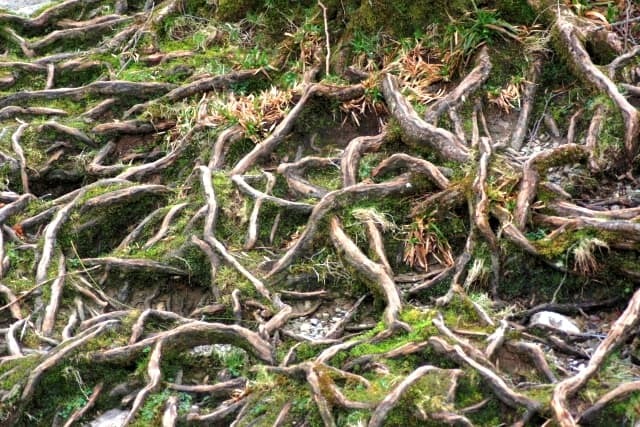 The root systems of trees are just as intricate as the branches and equally as important. When it comes to trees, we can learn a lot by looking down instead of up. Tree roots perform many functions. In the winter, they are the “camel” of the tree by storing essential food reserves to produce spring foliage. Roots transport water and minerals straight from the soil to the rest of the tree. They are also the “anchor”, keeping the whole tree firmly in the ground. Keeping healthy roots keeps healthy trees. So here are the most common causes of root injury and disease – AKA: a list of things NOT to do. One of the biggest killers of urban trees (Portland is no exception) is heavy clay subsoils and soil compaction. Both restrict oxygen and water uptake by roots, harming the tree. There are a myriad of ways soil compaction becomes a problem – improper landscaping fill, road construction, parking lots, foot traffic, livestock, and more. 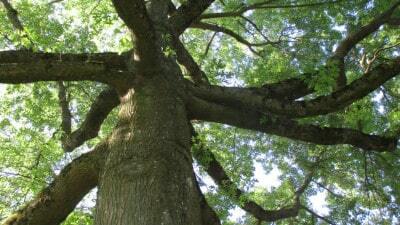 Adding or taking away soil around trees can have a drastic effect on the tree’s root system. An additional 4”-6” of soil can be enough to suffocate the roots from receiving necessary water and oxygen. 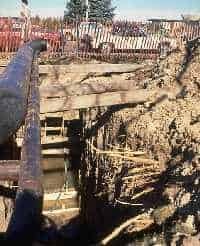 Removing soil from around the roots can leave them exposed to physical injury or change the soil conditions, altering how the roots can grow, and even reduce water availability. Over watering causes the pockets of air in the soil to fill with water and restricts the root system’s ability to take in oxygen. Too little water does not create the moist conditions necessary for root development. Too much fertilizer injures and kills roots (just like too much medicine for humans). Not enough fertilizer results in a lack of essential minerals necessary to keep the tree healthy. Be careful when digging trenches, damage like this can be detrimental to trees. cause undue stress on the root system. Even prepping the topsoil for flowers around tree roots can cause stress or injury. Digging trenches for utilities, holes for fence posts, or large holes for backyard pools can harm roots in a big way. Avoid root injury by mapping out the root systems ahead of time. You will know it is no-good when you see mangled roots sticking out of the ground. Putting pavement, plastic, or concrete over tree roots can be detrimental in more ways than one. It can either kill the tree roots, or cause significant damage to sidewalks, driveways, patios, or any other slab placed over tree roots desperately looking to find water and oxygen. We know that this is a lot of information, and to be honest – this doesn’t even cover the two different kinds of roots, types of root disease, how roots grow, signs of root disease, and what to do when you do find root problems. As certified arborists, we’ve taken time to understand all of the complexities around keeping healthy roots and understand why many don’t care to. If you think trees on your property could use a good, hardy root assessment – give us a call. The best tree care specialists plan early for potential problems and we’ve done just that with both commercial and residential clients for over 23 years in Portland and all of the surrounding areas.